The Romanian Companies Database 2012 edition, including the ranking of the most profitable companies has been recently released. Tops of Romanian companies are built using geographical criteria (county, town) , activity domain and the balance sheet data reported. SIVECO Romania has ranked First Place on the Top dedicated to Large Companies, having as object of activity carrying out software products adjusted to the customers’ requirements (customer application development). 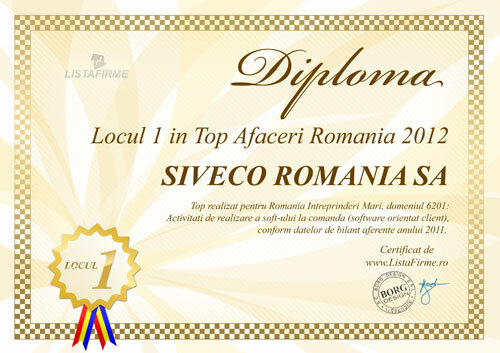 SIVECO is also placed on top position of the most profitable Large Companies in Romania. “Professionalism and efficient management have led your business to the Winners’ Top. Your performance deserves to be viewed, recognized and admired by your collaborators and customers,” have stated the representatives of the National Classifications, when granting the awards. In 2012, SIVECO has received other 23 prestigious awards in international competitions such as European Business Awards, Stevie Awards, European IT Excellence Awards, Best in Biz Awards, European Seal of e-Excellence 2012, European Software Excellence Awards and within events organized by the Ministry od Education in Oman, National Exporters and Importers Association in Romania, International Project Management Association ş.a. These awards have been won by the projects of eLearning, eHealth, eCustoms, eAgriculture and Customized Application Development, successfully developed by SIVECO in Romania and countries of the Gulf Region, Central Asia and the Caspic Region, North Africa, as well as for organizations belonging to the European Commission’s structure. “Promoting performance and recognizing it are very important for us. These good results are due to our team’s professionalism, and to the capacity for mobilizing and adjusting to the current economic conditions. They reflect our foremost concern in providing our customers with the best solutions that would increase their profitability and competitiveness”, said Irina Socol, President and CEO of SIVECO Romania.